This recipe started out as a quesadilla filling,, I enjoyed it as is, mounded in a bowl with a hefty dose of freshly cracked black pepper. First some basics on the chicken. You can use any type of cooked chicken you can get your hands on, but I prefer to take a package of skinless, boneless chicken breasts (a little over two pounds this time) and poach it in some boiling, salted water for about 20 minutes. I remove the breasts from the boiling pot to a cutting board and tent them with foil to keep them moist while they cool for a bit. Then I dice them and season them with a generous handful of Montreal grill seasoning. I use what I need for the specific recipe I'm making, and then I freeze the rest in one cup portions for future quick-fix meals. Cannellini beans remind me of potatoes. They're so creamy and blend so well with other flavors and textures. You can sub in great northern or black beans for this recipe if you desire, but you'll forfeit a bit of the creaminess factor. In a large skillet heat olive oil over medium-high heat. Add onion, red bell pepper and banana peppers. Season with the crushed red pepper flakes and salt and pepper. Saute until veggies have softened, 6-8 minutes. Add the garlic and saute for another minute or two. Sprinkle the flour over the veggies and stir to combine. Cook while stirring for several minutes so that the flour loses its raw taste. Whisk in the chicken broth and stir until bubbly and smooth. Add the baby spinach and continue cooking for another minute or two or until spinach has wilted. Stir in the cooked chicken and cannellini beans and remove from heat. Spray a large skillet or griddle with cooking spray. Heat over medium to medium-high heat. Place one tortilla on griddle and spread cheese over tortilla. 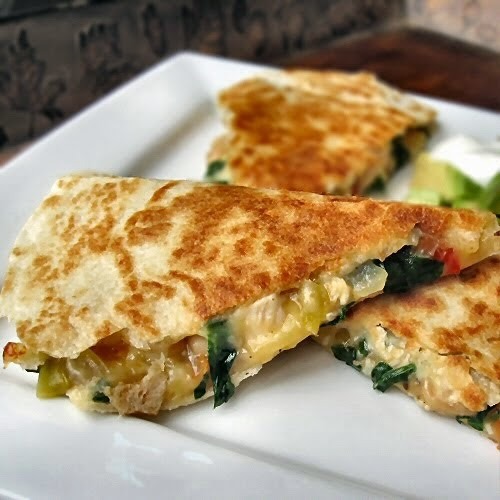 Spread chicken, bean and spinach mixture over one half of the tortilla. Check underside of tortilla and when browned a bit, flip the half with just cheese over the half with the chicken. Remove from heat and cut into slices. Top with diced avocado and sour cream, if desired.